Daily protein requirement can vary based on several factors, including age, gender, genetics, health and the quality of the protein. For this reason, we can only provide general guidelines to help you get an idea of how much protein you need. One way to define protein needs, is to say that every day we need about 7 grams of protein for every 20 pounds of body weight. This means that if you weigh 150 pounds, you would need about 52.5 grams of protein each day. Many healthy eating experts put it a different way by saying that we should get about 30% of our calories each day from healthy eating protein sources. Protein has about 4 calories per gram, so if you consume 2400 calories a day, about 720 of them should be from protein. Yet another way of putting it is in reference to the Food Guide Pyramid, which is a way to visualize the amount of food you should eat from each of the five food groups, each day. 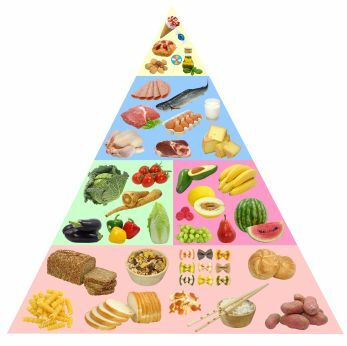 The advantage of the pyramid is that is shows the relative amount of food from each category. Carbs on the bottoms, sweets and high-fat foods on the top, with veggies, fruit, dairy and proteins in the middle. 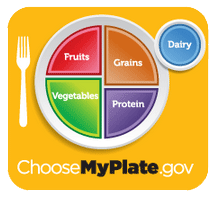 It is interesting to note that, after twenty plus years, the USDA has changed their visual representation for eating healthy from a pyramid to a concept called "MyPlate." This newer model shows a dinner plate divided into four portions for Protein, Vegetables, Fruits and Grains, with a side of Dairy. If you are not a mathematician, but a gourmand, and you don't want to sit around doing equations to find out what you should eat. Suffice it to say, that if you live in a developed country such as the U.S., it is more likely that you are getting too much protein than not enough. When you consider that most foods have some protein and many foods, as listed above, are a significant source of protein, if you are eating three healthy meals a day, you are probably getting enough protein. However, if you live in an underdeveloped country, protein deficiency could be a real concern. People in poor countries struggle to meet the minimum requirements for protein. Click here for more information on Protein Deficiency. If you have eggs (possibly with sausage or bacon) or cereal with milk or toast with peanut butter for breakfast, a salad with chicken breast or a ham and cheese sandwich or minestrone soup for lunch, and a hamburger or a pork chop or spaghetti and meatballs for dinner, you are most likely getting more than enough protein. Even if you missed one of those meals, you probably are still getting enough protein. For meatless protein sources, a serving, which is 1 large egg, 1/2 cup cooked beans or rice, or 2 Tablespoons of seeds, nuts or peanut butter, is equivalent to only about 1/3 of the protein in a serving of meat. Tofu is also in this group with a serving size of about 4oz. In addition, most nutritionists recommend that, whenever possible, choose a leaner or low-fat version of the significant protein sources. 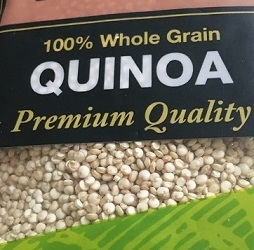 Another aspect of daily protein requirement, is that foods that contain all of the essential amino acids are called “complete proteins.” These complete protein foods are generally animal foods. Plant foods do not, as a rule, have complete proteins, but by combining certain plant foods, called “complementary proteins, ” you can make a complete protein. For example, when you eat Lentil-Rice-Tomato Soup, you are obtaining a complete protein. The rice and lentils complement each other, in that each has some of the essential amino acids and when eaten together, they provide all of the essential amino acids. It is generally believed by nutritionists that it is not necessary to eat these complementary proteins at the same meal. Vegans and Vegetarians need to be aware of the importance of the essential amino acids in planning a healthy meatless diet. Click here for more information on Vegetarian Diets. What if I don't meet my daily protein requirement? You already know that protein is an important nutrient in your diet. For that reason, if you do not get your daily protein requirement, it will have a noticeable effect on your health, from making you more prone to infections to causing you to literally waste away. Severe protein deficiency is usually associated with starvation and malnutrition and is a major cause for concern in developing nations, especially among children. In developed countries, severe protein deficiency is prevalent among those in extreme poverty or those suffering with eating disorders, such as anorexia nervosa. Severe protein deficiency can be fatal. What happens if I exceed my daily protein requirement? As with anything, you can get too much of a good thing. If you eat too much protein, your body can convert it to energy, and if that energy is not used, it will be stored as fat, which could lead to obesity. In addition, eating too much protein puts a heavier load on your kidneys which must get rid of the by-products of protein metabolism. There has also been some suggestion of a link between eating large amounts of animal protein (which is usually accompanied by saturated fat), and heart disease, cancer and possibly diabetes. The bottom line is, although protein is good for you, don't go overboard. Eat some protein foods as part of each meal. Eat protein from a variety of sources. In the case of animal protein, concentrate on the leaner or low-fat types. Just for fun, investigate some of the protein foods from plant sources to see how they may contribute to your healthy eating lifestyle. Click here to go from Daily Protein Requirement to Protein Facts page.